The sparkling waters of Cook Inlet and Chugach Mountain peaks are at your fingertips from this 2-bedroom, 2-bathroom vacation rental home in Anchorage. Enjoy easy access to shopping, dining, and entertainment in the big city, while the towering evergreens provide a serene, secluded getaway. Fill your days with hiking trips, sightseeing, bike excursions, and more! This spacious hillside retreat is in a very quiet neighborhood with great timber-filled views and high-end amenities. With accommodations for 4 guests, this is the perfect place to bring your family, share a couples trip, or just spend time with friends! After you walk up the stairs and along the deck to the front door, you'll enter into an expansive living space. 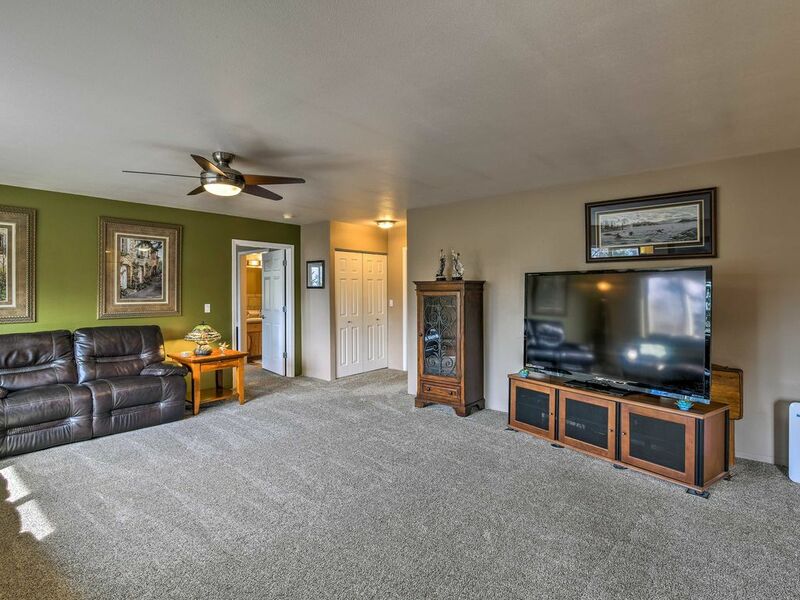 With cozy furnishing and a 75" flat-screen Smart TV with cable, the living room will definitely be the place you turn when you're looking to wind down and take a nap. As you enter into the kitchen, it'll be hard not to stare at the beautiful custom cabinets paired with granite countertops and stainless steel appliances. Bring home your catch-of-the-day after fishing Ship Creek and cook up a feast in the fully equipped kitchen. Enjoy your hard-earned meal at the island with bar seating or the 6-seat dining table. After a long day of travel and activities, you'll be ready for a good night's sleep. Make your way to either bedroom, both furnished with plush queen-sized beds, flat-screen cable Smart TVs, and cozy, mountain-themed decor. The master bedroom includes an impressive walk-in closet, workout equipment, and an en-suite bathroom with a jacuzzi tub, walk-in shower, and granite, double-vanity sinks. Wake up in your hidden mountain getaway well-rested and ready to take on the day's adventures! Anchorage, Alaska proves to be the ideal spot for a unique vacation. With an inlet on one side and panoramic mountains surroundings, you can interact with wildlife, walk on a glacier, and explore national parks all in a day. The home comes equipped with 4 adult-sized bikes and helmets for you to explore the 135 miles of bike paths that travel through the city. Start your morning with a scenic ride on the 11-mile Tony Knowles Coastal Trail. If you trip falls between the months of September and April, chase the Northern Lights. This beautiful phenomenon is one you won't regret staying up all night to view from Girdwood, just 35 miles from the home. Make the 10.8 mile trip to Ship Creek in the summer for some of the best salmon fishing. If you're still looking for more outdoor time once you get back, head out the door to the nearby trailhead and hike through Far North Bicentennial Park. Once you've worked up an appetite, head 10.7 miles to downtown Anchorage and explore the food scene. Sip on a cocktail while you indulge in the beautiful sunset! My dad & mom stayed here while visiting my family in Anchorage. It was perfect for them. I felt like they were in good hands with the hosts. It’s a beautiful place! We are a family of 5 who came to Anchorage for a weekend getaway. We chose this vacation rental mainly for its close proximity to bike trails. We got so much more! This apartment is so spacious! Definitely offers more than your typical 2 bedroom apartment! It was very easy to feel at home in such a lovey setting! We really enjoyed talking with the owner and getting to know him. We highly recommend this Hillside retreat! You won't be disappointed! This was a fantastic rental. Everything about the place was comfortable and top of the line. I would stay here again! Wonderful home. Spacious and comfortable. Even more beautiful than the photos. The hosts are very engaging. Absolutely my favorite rental ever!!! This rental was super spacious and well stocked with spices and kitchen equipment! We hosted thanksgiving dinner for 6 people. It was a breeze with the double oven and all the pots and pans available! TJ & Missi were great to work with and super helpful. We will definitely stay here again when in Anchorage.